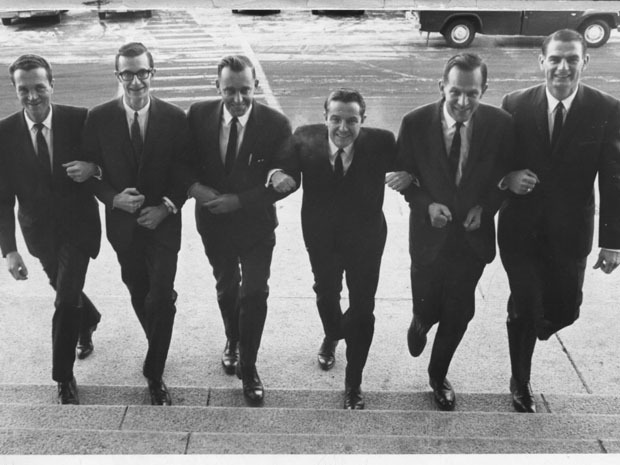 The Progressive Conservative Party in Alberta in 1965 had no leader and no seats in the Alberta Legislature. What little active support it still held was more apparent during Federal elections than during Provincial campaigns. That year a Provincial leadership convention was held in Edmonton. It was a scene which had been re-enacted regularly throughout the half century during which the Conservative voice had never been more than a squeak of protest in the Legislature. 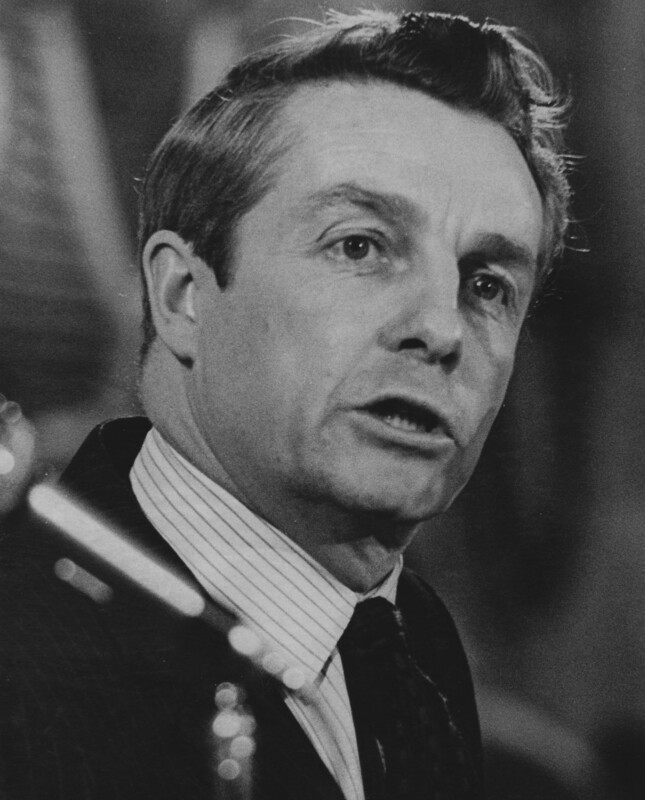 This time, however, the Party chose the 36-year-old Peter Lougheed to recruit and direct its Provincial forces against the firmly entrenched Social Credit Government. 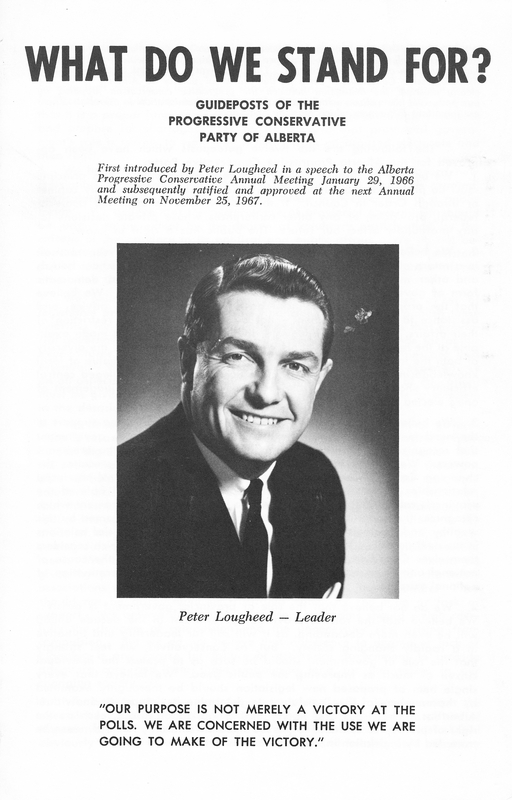 Peter Lougheed was one of the few men who could have acted as a catalyst to his almost moribund Party. As a third-generation Albertan and grandson of Alberta’s first P.C. Federal Cabinet Minister, he received the loyalty of the Party “regulars”. As an imaginative and determined leader, he was able to attract new members to the Conservative Party — men and women of ability who shared his goal of routing the complacent Social Credit Party and replacing it with a government capable of fully developing the Province’s great potential. 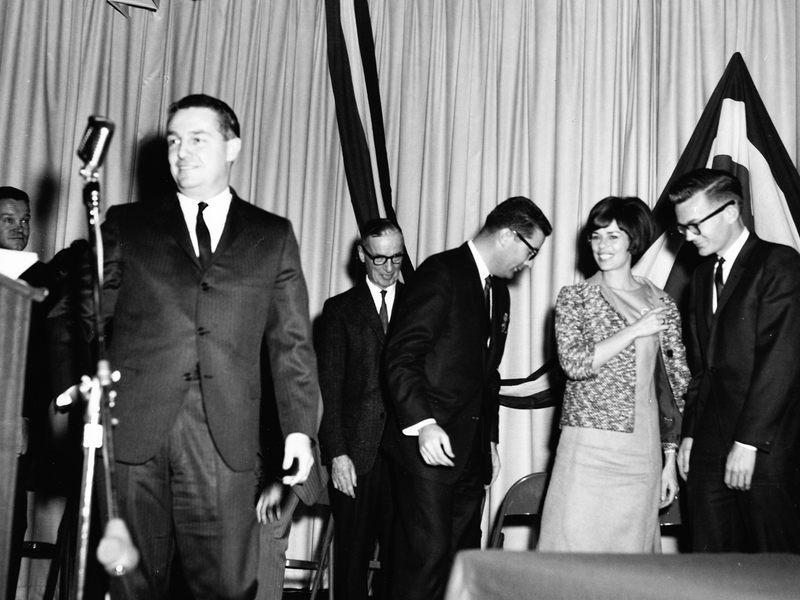 On that March weekend in 1965, the Conservative cardholders were few and Party organization practically non-existent. By the following January, many new faces appeared at the annual meeting at the Palliser Hotel in Calgary and the revitalization of the Party was beginning to be evident. It was at this meeting that the “Guideposts” were introduced — those twelve statements of Progressive Conservative principle which have remained unchanged as the basis of Party direction. But it was not until the provincial election in the spring of 1967 that the Progressive Conservative Party of Alberta emerged as the coming force in Alberta politics. Unpromising Party. An Impossible Task. Usually, I save the above quote for political pundit, Stephen Carter, but, in the following instance, it seems to work just as well. For the sake of posterity, I have put the following quote in my calendar and dated it—July 8, 2016. A year from now. Who knows, he may well be correct. But, if he isn’t, I can remind him … for posterity’s sake. In 1997, shortly after Mr. Jobs returned to Apple, the company he helped start in 1976, Dell’s founder and chairman, Michael S. Dell, was asked at a technology conference what might be done to fix Apple, then deeply troubled financially. After almost 110 years, PC Alberta has seen better days. But, like the province, born on the very same day in September 1905, the character and pride of serving has never diminished. The canvas is scarred, but the fabric is battle-worn and strong. Farmers, doctors, lawyers, tradespeople, students, and people of all backgrounds have made up its membership. And, for eleven decades, it has faithfully served the people of Alberta in government and opposition. Fifty years later, Mr. Harrison and others are saying these things again. Therefore, as we reflect, we must also strive to rebuild and renew. 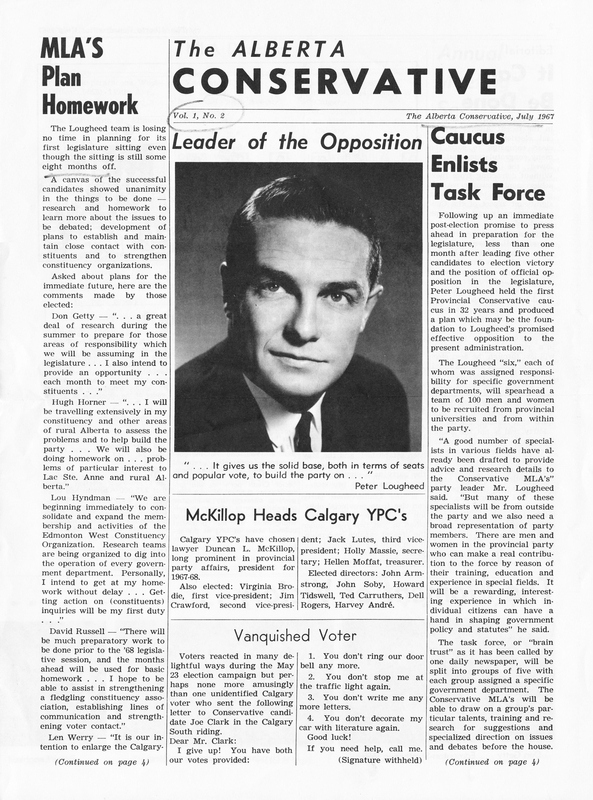 In 1967, Lougheed challenged the Party to establish itself as the alternative to the government of the day. He also spoke of the many Albertans who wanted to join the Party, but were looking for something first. But, what was it? As of late there had been too much ‘mystery’ and ‘intrigue’. We had become disoriented and lost our way. We had stopped listening to Albertans and we had stopped listening to our members. No more. This is a brand new day. We will listen. In the future, all discussions within PC Alberta must involve the rank and file of our Party. The Members. The Grassroots. The People. NOW! is not the time to quickly fold up the tent, as Mr. Harrison would have us do, but, instead, it is time to lift up the flaps and let some fresh air in. Let it breathe. Listen to the ‘people from every part’ of the province. There is true opportunity in defeat. A rebirth, if you will. 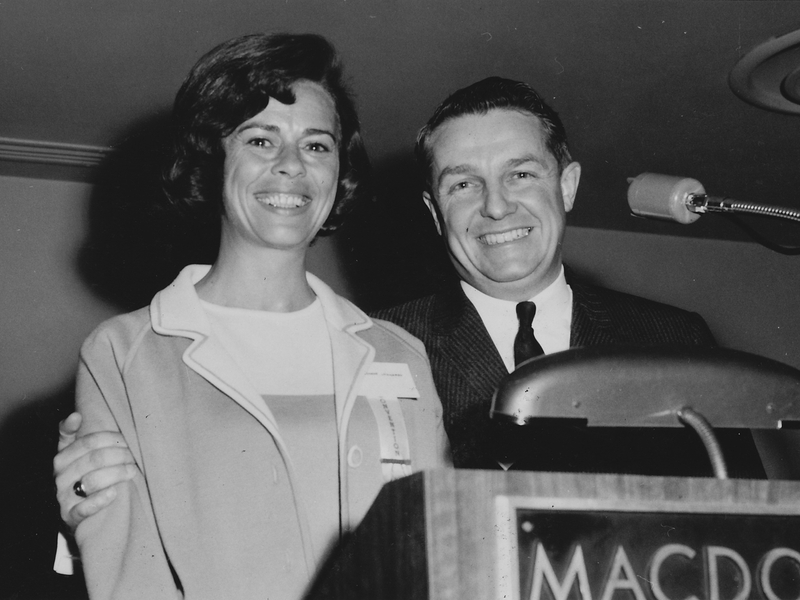 “We have the potential — we have the opportunity — we must realize our potential — grasp our opportunity.”—E. 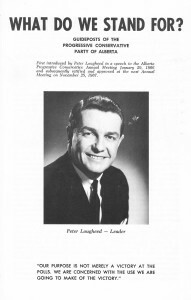 Peter Lougheed, 1967. What are these current issues? I see them as seven challenges I want to conclude by setting them forth. The first one is to sustain sound financial management. You may think that is ho-hum but just look at the serious problem of government deficits and of peoples’ expectations. Figure out how hard it is going to be. We have to manage better with less! We have got to get away from this, “I am alright Jack point of view”. On one hand people urge us to spend more money on their favorite program but, on the other hand tell us to cut down on total government expenditures. A key is public sector wage and salary settlements. Decisions have to be made in a way that recognizes what’s going on in the private sector. We have to constrain both now and in the future, wage and salary settlements in the public sector. Keep in mind those two out of twelve months funded by the income from the Heritage Savings Trust Fund. Let’s preserve the capital of the Heritage Savings Trust Fund! So, sound financial management, that is the first challenge. The second challenge is tied directly to a leadership role in Canada. It isn’t just Alberta on this one because we can have a strong financial position. I tell you, if we keep going the way this country is going in terms of health care costs, Canada is going to end up a financial basket-case! We are going to have to show leadership. Yes, it is tough to show leadership when you are isolated at times but we have been there before. To show leadership in constraining health care costs in a multitude of ways, is a challenge not only for the immediate year, but for the years ahead. It requires the cooperation not only of the public, but of all of the people that are involved in the system. Do you know what is at stake? Just make a trip over to the United Kingdom and take a look at how their medical care system is working out. They now have two systems. Friends of Medicare – that is a bunch of nonsense. The real friends of medicare are the people that are trying to make sure that it is a financially sound system. The other Friends of Medicare just want to have a blank cheque. Do you know what’s going to happen, what is happening in the United Kingdom on that issue. Yes, you will have private insurance for those who can afford it and then you will have a less effective, less superior service for those who are involved in the system and can’t afford it. That is not what medicare is all about and I hope we will take that position. The third challenge involves working with the private sector. Working together on new national economic policies. New national energy policies so that the crucial job producing oil and gas sector faces a tax system not more onerous than other industries in Canada. New national policies involving the marketing of our natural gas. It requires new freight rate approaches and strategies. It involves new ways of encouraging equity financing. Another challenge is encouraging the entrepreneurial spirit in the province. We have to cut out unnecessary regulations. We have to privatize public services that can be done better by the private sector and we have got to continue to have more dialogue and more good ideas and suggestions from the business groups in this province. Another challenge is to make a major effort to involve more volunteers. To modify some of the bureaucratic ways, which have discouraged the volunteers, by cutting out the red tape – to challenge some of the existing community groups to become involved in more specific ways – to give them some ideas as to how they could help out, to find new roles for the volunteer in our government and its programs. So, another important challenge is a major effort in our past to get back to where the volunteers are the heart of the community. The sixth challenge will be controversial. We must modify our school curriculum so the graduates of our educational system are able to compete in the new world marketplace. We have to change fifty years of the accepted view that the major decisions in the educational field should be made by the experts and not the public. That doesn’t mean we are not going to work closely with the people who work in the classroom. But, the ultimate decision making has to rest with the public at large through their elected legislators. The final challenge of our country. There is only one real future potential for Canada in terms of jobs and prosperity and thus preserving our standard of living. We have to become not the fifth best traders in the world – we have to be the best traders in the whole world. Alberta has a role of leadership to play. This isn’t the sort of thing that is easy to explain but it can be realized for Canada. I don’t know any group in the world that travels more than Albertans. You run into them everywhere. Let’s harness all of this talent, input and knowledge, including from newcomers who have come here and from entrepreneurs who have travelled throughout various parts of the world. Canada has a great opportunity to be the effective traders. We have to change our educational programs in a way that focuses upon training people to be involved in international marketing. We have to find new approaches for business consortium. We have to find new approaches for selling not just our products but our services. We have to say to ourselves, we like those Americans but in the grain trade they are our keen competitors. We have to understand we like those Australians but they are our competitors. We have to go out there in the worlds and sell. Why is a provincial Premier talking about this? I’ll tell you why I am talking about it – because the challenge of the years ahead is a challenge that is going to require some leadership and I believe Alberta, not just myself, not just our government, not just our Party, but the whole province can provide that leadership. We can show the rest of the country how to be the best salesmen in the world. So, let’s meet these new challenges with good spirit, with confidence and with determination. But, with better communication by all of us of our ideas, the reasons for our decisions and the facts to back them up. Let’s not forget how we got here as a Party – how we sustained the public confidence and how we need to remember our basic concepts and fundamentals in order to further sustain the confidence. We can do so if we remain an open Party, a democratic Party; if we respond pragmatically to the circumstances that we face. If we seek consensus and don’t force confrontation or polarization and if we keep moving – not away from – but towards the mainstream of Canadian life. Finally, we can do so if we as a Party stand behind something that is very dear to me as a principle, the principle of free enterprise, yes, but free enterprise that cares. Now, I come to another concern. It is communication. This is a two way street. It is not just communication by 75 members of the Progressive Conservative Party that are elected – it must be communication by the 2100 delegates, by the 79 constituencies, by the total membership of the 79 constituencies. Do you know we did a poll recently? The poll had to do with the Heritage Savings Trust Fund. We asked the people of Alberta whether they agreed with the Heritage Savings Trust Fund. They responded overwhelmingly, yes. So, then we asked the people of Alberta – where does the money come from for the Heritage Savings Trust Fund? Over 50% of the people of this province think the Heritage Savings Trust Fund is funded from a gasoline tax at the pump. Think then about the communication job we have as a government Party. What am I trying to suggest? When an issue breaks, please don’t jump to conclusions. Ask the person, with due respect, what is the source of their information. Make your own judgement about that and then phone your M.L.A. and say, I just read a headline somewhere that said something. What are the facts? And when we send you the information, will you make yourself a personal commitment that with every document we send to you through the Party, you will actually read it – so you become not a headline reader, but a factual reader. So in summary, where are we at now? The Party is in good shape. The economy is recovering. The province is stable and financially solid. Well, how about me? First of all I am feeling really good. Jeanne is not only feeling good, she is looking good! I am enjoying the new challenges. I am enjoying them very much and I like working with this Party, so, that is where I am at. So, where do we go from here? That is my last question. What lies ahead for our province? Very different challenges! In our first term in office we were involved in catch-up. In doing a lot of things our mandate for new directions required us to get done – such as improving the situation for the mentally ill, the handicapped and the disabled in improving the quality of rural life in our province – in a multitude of other ways it was catch-up time. Subsequently we were involved in big national issues. Energy and the Constitution. They were dramatic issues. Now we are involved in different issues and different challenges. Why are they different? Here are four reasons why they are different. First of all they are more complex. They require more reading, more awareness and more understanding. Secondly, a real key, the support just isn’t automatically there with our position like we had, for example, on the Constitutional issue, equality of the provinces. Support on the current issues involves not necessarily a negative reaction by many Albertans but, they need convincing. They need communicating. There isn’t automatic support – so there is a harder communication job ahead. The third difference – they are not black and white issues. They are not similar such as a Constitutional accord where you sign a document and there it is. No, the current issues are much more subtle. There are a lot of greys. Finally, in terms of results, it might take years for our logic to be readily apparent. But, the decision will have a long term impact on people that we represent. The current issues are different. They are not perhaps as dramatic but in the longer term they probably are as important. Now let me discuss about where we are at as a province! Let’s remember a basic reality. Alberta is a commodity resource producing area. What happens in Riyadh, Peking, London, New York and various parts of the world affect you today. We are part of the world scene. We are going to have our ups and downs. But, even with the variables we mentioned in our Budget – 1984 will be a year of economic recovery for Alberta. It is a year in which our oil and gas industry is poised for expansion. We should move ahead in terms of marketing our natural gas both domestically and in the United States. Many things are happening on the oil side that are exciting. I think the explorers are taking a second look at being dragged into the frontier area on 80¢ dollars. They are beginning to take another close look at the heavy oils, enhanced recovery projects and the oil sands here in Alberta. These things are happening. The entrepreneurship of this industry and the talented people are a tremendous asset. We also have a strong and stable agriculture industry. Yes, there are ups and downs but, the high productivity is there. This is so in a number of other industries as well. We have a highly competitive petrochemical industry and new opportunities in terms of high technology. We have many things going for us in terms of our Alberta economy. What about unemployment? We have had an excessive immigration from other parts of Canada. It was far too rapid. We have also had overbuilding in the construction industry. We must adjust to this reality. We will therefore have unemployment at the national average for a period of time until we absorb the overbuilding in construction. Remember when people argue about construction jobs, let’s keep in mind what our budget of March 27 provides – we have, with only 2.3 million people, a $3 billion capital construction program. We lead the nation in terms of providing jobs in the construction industry. We have a budget that is responsive to the current economic realities. What about Alberta’s medium term outlook? I liked Provincial Treasurer Lou Hyndman’s comment, “Alberta’s best days are ahead of us”. I really like it because I believe it so much. Just ask people who live in other parts of Canada and in other parts of the world. You take the resources, entrepreneurship, stability and you take the drive and the education system we have here – it is unparalleled in the world. Alberta’s best days are ahead of us! Then, there is the budget of last week. I think it was a budget of balance. I want to just read the last paragraph. “In conclusion, this budget represents a sound financial strategy for Alberta, a strategy of balance. It balances the need to maintain essential people services with the need to constrain operating expenditure. It balances the desire to encourage steady economic recovery and employment growth with the recognition that lasting jobs are created by the private sector. It meets these objectives while at the same time holding down taxes, reducing significantly the deficit and our borrowing requirements. The result is a budget in tune with the times and with the aspirations, needs and expectations of Albertans”. I think it is one heck of a good budget. Three supplementary comments about our Budget. Hidden in the small print there are some very caring items. We brought in a home care program in stages. The first part of the home care program helped the senior citizens who needed medical help in their home. The next step now is for other seniors in the home. Even if you cannot get a doctors certificate to the effect that you need medical care. So we have a major increase in our home care program to help the people who are frail and elderly. I believe that is an important example of a caring government. It has always troubled us that we have year after year looked at our budget increases and wanted to reduce the total expenditure authorized. I am proud that for the first time in forty years, we have been able to reduce the aggregate amount of money that we ask the Legislature to approve. However, the Budget will only work if public sector wage settlements follow and do not lead settlements in the private sector. That is essential to the budget. I just want to say one other word about the budget. Do you know that the income from the Heritage Savings Trust Fund will pay two of twelve months of the total government bill. Two out of twelve months in this coming fiscal year are paid from the income of the Heritage Savings Trust Fund. Did you know that the accumulated federal deficit, now in terms of their budget requires approximately 20% to 23% of the total revenue to service their debt? We are in a enviable position in our province of servicing our provincial debt with 1.8% of our revenues. We also have left for those who have come after us a lot of tax room for the future. Let me now deal with a couple of current concerns. The expectations of people in this province were out of sight in 1980 – 1981. We have made some headway – expectations are being reduced. That is good but we have more work to do. We made many other changes since 1971. Let me deal with them in a brief way. Let’s look at resource management. I wonder how many of you recall that when we first came to office, the selling price of our oil – oil that we own as a province – was decided between the major integrated oil companies in Toronto. We changed that in 1973. We got control of our own resources. Then we developed exploration incentive programs that stimulated a wave of drilling activity and jobs through the late 70’s. Yes, then we were hit hard – very hard by the National Energy Program. But, we have come back step by negotiating step from that precipice placed in front of us on October 28, 1980. This was done with the strong support of Albertans. During all this time Albertans did something else exciting too. Albertans developed an oil and gas technology that is now valuable in the world marketplace. We maintained, during those years, the family farm despite a lot of pressure. We brought in a Beginning Farmer Program and Farm Credit programs. We did a lot as a government for agriculture but the key is that the family farm has been preserved – which was one of our election commitments. When we discuss productivity in the world – Alberta agriculture – Canadian agriculture, on a productivity cost effective basis, can match agriculture producers anywhere in the world. But, let’s make sure we never have a discussion – never have a Party meeting – where we don’t recognize the primary agriculture industry and its ability to compete in the world marketplace. Next I remember the election commitment. I remember when our original team of six M.L.A.’s met. We talked about whether we were going to develop as a province in the way the present office holders felt inevitable. Alberta was going to draw away rural life and from the small communities. We said no, it’s not inevitable. We can have a province of balanced growth. We can decentralize government operations as much as possible. We committed ourselves to encourage growth centres in this province. We accomplished a great deal. A few people don’t think that rebuilding rural hospitals is a good idea. I think there are quite a few people here that think rural hospitals are a very good idea! We also went with a rural gas program. We brought in programs for airports and roads. We significantly improved the structure and the way of life in small communities. What have Albertans accomplished since 1971 in economic terms? We lead the world in synthetic oil technology through Syncrude. We lead the world in terms of handling sour gas. We discovered large new natural gas reserves in this province. The skeptics said it wouldn’t happen – but we also developed a new strong petrochemical industry so that jobs didn’t have to continue to be shipped down the pipeline to Sarnia. In agriculture processing we have developed a whole new Canola crushing industry – and made progress in many other food producing fields. Finance – the financial centre of western Canada is not Vancouver, it is right here in Alberta. What about science? Do you know there are over 2000 scientists working here in Alberta. These include the Scientists in the medical Research Foundation financed by the Heritage Fund. So, in economic and technological terms, we have come a long way! How about our involvement with the rest of Canada? “What do Albertans really want?” Well, we have frequently been asked that question. I think the message is finally getting across. We want to be a full part of the mainstream of Canadian life. I am not talking about just government – I include most Albertans – whether it is in sports, arts, culture, science, education or whatever. We have come a long way and we are now fully a part of the Canadian scene. Let’s be extremely proud of our many achievers – in many fields. What about Alberta in the political mainstream? Well, I really tried hard not smile when we went down to sign the Constitutional accord but, the amending formula strengthens the resource ownership by our province for the generations ahead. The idea that all provinces are equal in confederation, that there isn’t a difference in the Constitution because one province has a larger population than some others. I remember in 1976 when we were alone on this concept but we won them over step by step. There isn’t a major national decision made today when those involved don’t say – “I wonder what the Alberta reaction is going to be?” Friends, since 1971, this province has moved into the mainstream of Canadian life. We have come a long way! So where are we at now in the Spring of 1984 as Party and a province? Let’s look at the Party first. Just look at this Convention. Our largest Convention ever. 90% of the delegates are registered from the provincial constituencies. Our membership sales, at this time of the year for the provincial Party – higher than anytime in our history other than in election years. That is very important – because it is membership that counts in the long haul. In terms of finance – with the unsung volunteers that are involved – we went from a deficit of a quarter of a million dollars to a surplus of a quarter of a million dollars this past year. But, hold on, the surplus is for the next election fund. So we are in a pretty good position as a Party – the Party and the Caucus are working very well together. How about input from the Party? Maybe I need to say a word about that because of the process. The ideas that you have come up with – the Medical Research Foundation came out of a Policy Conference discussion. The whole idea of a Municipal Debt Reduction Plan came out of a convention resolution. The concept of the Heritage Fund came from a convention debate. That is what being a member of our Party means. That is what being a delegate means. Now, I want to pause on my list of fundamentals to remind a few of you of the last Party Convention two years ago at the Edmonton Inn. I went around the hotel and visited with many delegates. Everywhere I went there was one phrase that everybody talked to me about. I went back into the room and I said, what had occurred – I couldn’t get anybody to talk about anything other than W.C.C. [Editor’s note: Western Canada Concept] Well, I like a real challenge so we said, let’s pull ourselves together and be happy warriors with a new challenge. From that annual meeting in 1982, we devised a new game plan. It started with getting out from under the Legislative dome – out talking to people – travelling the province and communicating. It involved going back to the people who had supported us as volunteers and encouraging their involvement again. 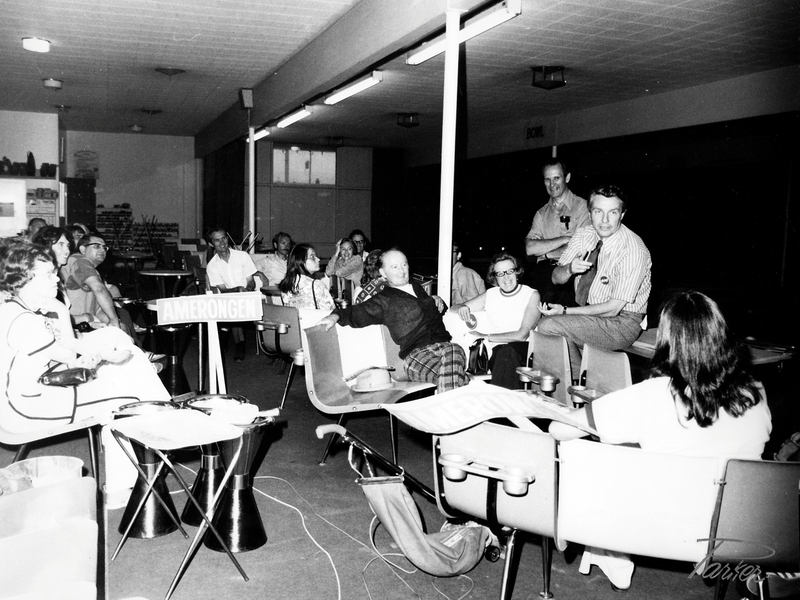 It involved responding to the issues that were brought up at our 1982 convention. Remember those issues? One of them was mortgage interest rates. Another one was surface rights. Another one was Widows’ pensions. So, let’s always listen carefully at our annual meetings. Then let’s sit down at Caucus and discuss what we’ve learned from the delegates at the annual meeting. We have listened and have responded to them. In the Spring of 1982 we then considered what is the way to campaign in the next election campaign? How could we say what we felt in almost one word? 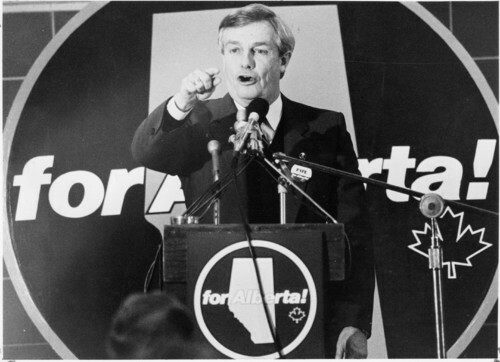 We campaigned as you remember not against anything – we campaigned for Alberta. How did we campaign? Again, door to door! With a door to door message and a complimentary electronic message by the leader – we campaigned positively! We developed a brand new theme for the Party. It is a theme that I hope you will keep front and centre as a Party – “Free Enterprise – Yes – but, free enterprise that cares”. So, let’s not forget the fundamentals upon which this Party was built. Feel good about these fundamentals. Don’t forget them – don’t forsake them. We do so at our peril because they are basic to our success. Let me move next to where we have come from as a province since 1971. We have come a long way and it is important, at an annual convention, to review where we have come from. Yes, we have made mistakes. Most of them have been by commission rather than omission. Some we have adjusted and with others we need to do better. But, we have made Alberta a much better place to live in terms of people services. Since 1971 we have developed here, in Alberta, perhaps the best health care delivery system in the whole world. We have put together educational facilities overall that are also unparalleled. We have brought in an array of special people programs – to help the senior citizens, the aged, the pioneers and the disadvantaged. What about individual personal income? The personal income in this province was in fourth place when we came to office. We are now in first place. We are in first place in terms of family income and we have more people in this province – in relationship to the population even today than any province. We have created – even with the present economic downturn – between 1971 and 1984, more new jobs in the province of Alberta on a comparative basis than any other part of Canada. That’s another important accomplishment. What about quality of life? Well, I believe we have done fairly well to preserve our environment. We also have developed parks and recreation facilities, historical facilities and cultural facilities together with program content to go with them so as to improve the quality of life for our people. We have done all this but at the same time we have been able to essentially preserve our values, including one that is absolutely crucial. That is helping one’s neighbour – part of our pioneer spirit! Yes, I realize we are now into an economic adjustment period which I believe will be short term. But, let’s admit something, this province was on an upward curve, that could not be sustained. Even aside from external events we just had to come back to earth and adjust. Then we came to the 1971 campaign. There were some other fundamentals that arose out of that campaign. We made a decision in 1971 to take our message to the people – to go to the doorsteps and to the farm houses all over this province and we have never let up on that fundamental. We also developed a platform of new directions and an undertaking that we would follow through with our election platform commitments. PCAA Party Leader, Peter Lougheed, and Party volunteers supporting Gerry Amerongen, Edmonton-Meadowlark, during the 1971 Alberta general election. 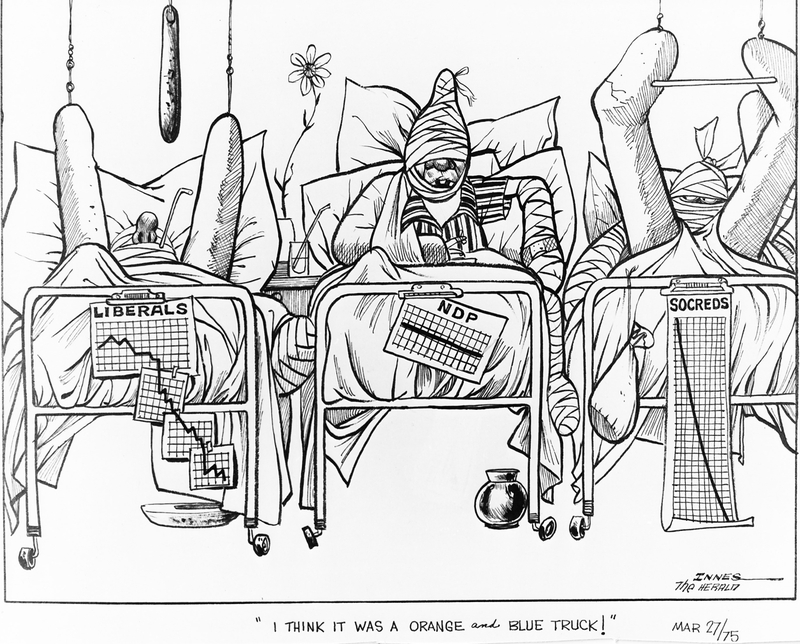 Another part of the 1971 campaign was that we had a game plan. The game plan, while we were in opposition, was to say nothing about the government. Don’t believe that wasn’t difficult! Don’t think I didn’t get the skeptics coming to me as we went through those weeks in August 1971 saying, “This won’t work, it is too quiet out there. You have got to make some noise, you have to tear people down, you have got to start fighting with good people on the other side who are well motivated.” I said, we have a game plan and we have to stay with that game plan. It clearly worked despite the skeptics. 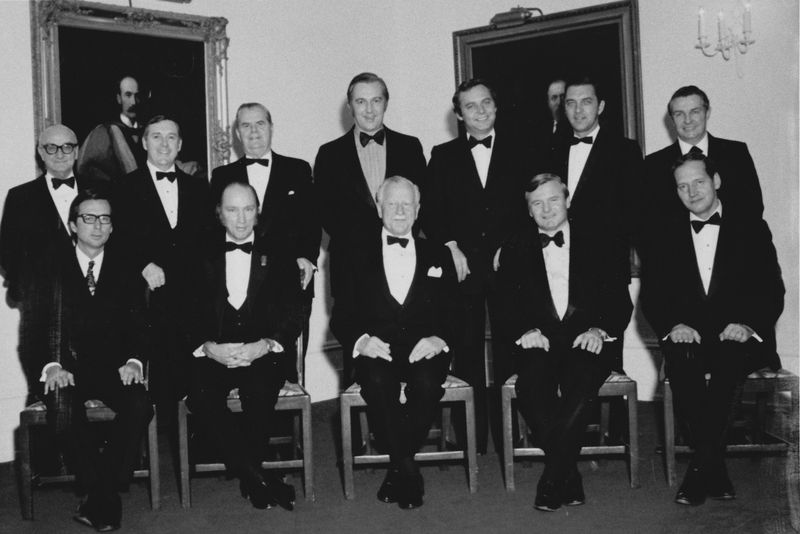 It was perhaps the only time a new government was elected in the sense that the people weren’t voting against the existing government in 1971, they were voting for the Progressive Conservatives. That is another fundamental. There is another. We formed the government and together as a Caucus we committed ourselves to follow through on our election promises. We distributed a document in the last election campaign called ‘Pledge and Progress’, of which I am very proud. The next decision we made was in relationship to the Caucus itself. Again, the skeptics don’t believe this – we vote at Caucus. 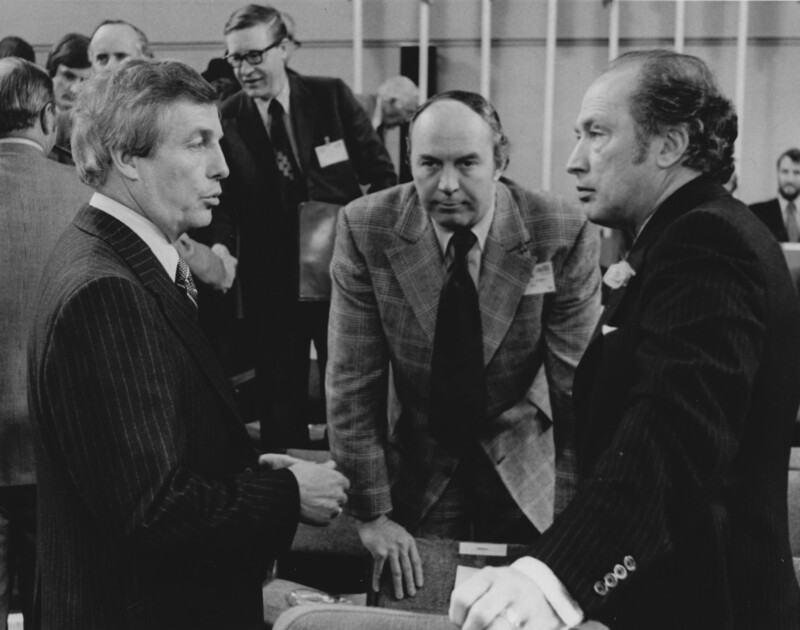 In our first Caucus meeting after the election in 1982 – well there was a decision we were arguing about – I think it was the percentage of the Alberta Energy Company that the government should hold. There was quite a difference of view. So, I said, ten minutes from now we are going to vote. We voted. That is a fundamental principle. It isn’t followed by any other government Party in Canada. Our decisions are made by the Caucus and we do it by votes. If you want to talk about teamwork, that is the way to have teamwork because everybody then really is a part of it. There is another fundamental called responsiveness. The hardest thing in politics is to listen. Why is it hard? Because it isn’t the loudest noises that count. What you have to listen to is the quiet majority of Albertans out there. That is the key. Let’s keep listening to them. There is one other fundamental. In 1971, I remember a discussion whereby someone said they didn’t vote for us on August 30, 1971 down south of Calgary, so why should we worry about them? Wow, that would have been a drastic mistake because what is important is that you are elected to represent all the people. That is a principle of what’s involved. Some of you new to this Party won’t believe the next line. Do you know that the senior citizens didn’t vote for us in very large numbers in 1971? We decided that maybe we ought to consider the senior citizens more positively. They are the pioneers that built this great province. We should bring in programs to really help them. The public would accept those programs. We introduced new program after new program. I think most of you who have been out there campaigning know, that the senior citizens in a very significant percentage now vote for this Party. So the principle is – never conclude that a group doesn’t support our Party. Never say that. We are a Party of individuals and it is each individual that is important. It is not groups, not occupational groups, it is the citizens at large. So, that is another fundamental of our provincial Party. I want to mention another one. It is hard for me to communicate the concept but let me try. If you want to see me wince, just stand up and say, when we came to “power” in 1971. My whole idea about being in politics is the absolute antithesis of the word power. The concept of power is not the concept of serving. We are here to serve the public. Power means that you come down from on top. We are here to serve. That is important and from your reaction I sense you understand this concept. When we were first elected we were asked – “why don’t you be bold?” We have been – we were bold when we brought in the Heritage Savings Trust Fund – we were bold when we took the stand on the Constitutional amending formula – only one of eleven governments at the start. We were bold when we sat down on the Syncrude deal and out-negotiated the others. We have been bold since we were first elected – thank gosh we have been – it has been good for this province. There is another basic one and is it ever important for the government that is seeking re-election. They may have voted for you but you have got to continue to hold their support. If you are Neil Webber or Jim Horsman and you go out knocking on doors between election campaigns – I tell you it is worth ten doors knocked on during an election campaign. Don’t take a single vote for granted, ever. We never have and we live by that concept. I thought I might talk a little bit today about politics. I haven’t had a chance to talk with you since November 2, 1982. What is Politics about? It starts with getting elected, then with meeting your promises and commitments, then doing other things to help people, then it moves to getting re-elected and to sustaining that support. So let’s talk about our record. We started in 1965 with no seats. The first election of 1967 we won six seats with 26% of the popular vote. In 1971 we won 49 out of 75 seats and 46% of the popular vote. Then we sought a renewed mandate in 1975 and we won 69 out of 75 seats with 62% of the vote. Then in 1979 we increased again our majority to 74 of 79 seats with 57% of the vote. Then in 1982 the most incredible result – unparalleled anywhere – for a government in office seeking its third mandate for re-election – we increased our majority to 75 seats but the real key, we increased the popular vote to 62%. Well done! What I am trying to say is that it is easy to talk about what you will do. What counts is what you do when you have the responsibility. When you get into the kitchen, can you take the heat? Can you make the tough decisions? Can you maintain your balance? Talk comes fairly easy. It is action that counts. The test of performance is to sustain that support and that confidence. So, what I want to talk about today are four basic questions. First of all, how did we as the Party get where we are? Secondly, where did we as a province come from? Third, where are we at now in the Spring of 1984 as a Party and a province? Last, where are we going as a province and a Party? Well, how did we get here? As I said, it was from scratch. I think it is important, therefore, to discuss why and how. There are some key fundamentals. It is important to remember what they are. Dear friends, we ignore these fundamentals at our peril. We started, as I say, with nothing, without seats, money or organization. We had no IOU’s and we still have no IOU’s. We have moved ahead with a solid foundation. What are the fundamentals? Let me go over them as I sense them – have you think about them and then raise them with me tomorrow if you wish. The first fundamental of the Provincial Progressive Conservative Party is that it be an open democratic Party in the fullest sense of the word. Open in its nominating meetings, open in its request for people to come and join – continually inviting new people to come in. Never closing the door. That in itself is very meaningful. If we had ever taken the position that you have to show some credentials or some Conservative background or something, to come and be part of this Party, we would still be meeting down in the basement. We invited people to come in from other Parties. We invited them to come in and be a part of our team. If they had never been involved in the political process before there was a special invitation. That was important. So, that is the first fundamental. An open, democratic Party. The second fundamental is really important. We started out with a strategy. I guess you would call it strategy but it was more the attitude of the people. We said, let’s not do it the old way. Let’s have politics in which we present ourselves positively as to what we stand for. What we stand for as a Party, what we will do if we are elected. That is the way we started because that is the kind of people we are. If there is one thing that bothers me about politics, it is tearing people down and questioning their motives. I argue with their judgement, I often dispute very much their point of view on issues but I don’t believe in questioning peoples motives. We never have, we never will and let’s keep it that way. The other fundamental is volunteers. You don’t run a political campaign other than through volunteers. How do you get volunteers? You get volunteers by asking them to come, by making them feel good because we are positive, by having an open Party, but more than that, by listening to them and communicating with them and making their presence really count. So between 1965 and 1971 it was bringing in volunteers to our constituencies, that was key. A short two and one-half years ago, we met here in this very room — Our past was unspectacular — our future uncertain — but we decided then and there to build — for the first time — a strong Progressive Conservative party in Alberta. To our critics we were an unpromising party with an impossible task. Today, even the critics concede that while the task remains difficult, we have firmly established ourselves — Established ourselves as the alternative — the alternative to the present complacent administration in Alberta. We have the potential — we have the opportunity — we must realize our potential — grasp our opportunity. We have begun to prove our promise. But we have only begun. I would first like to make a few brief comments upon our organizational progress. There is really no need to emphasize to you in this room that the best of ideas — the best of people — will flounder and dissipate without effective organization — Organization to cause the communication of our views — of our candidates — to the public of this province. We now have an effective central political organization — It has gaps — but on balance and in comparison it is well established. The two offices need your continued tangible support. But they are working — creating a close liaison between provincial and federal constituencies — between M.P.’s and MLA’s — we have, as you know, working committees at the central nerve centre — in finance – in policy research – in communications – in organization — forming the second line behind your provincial executive and your caucus. We now have reasonable communication with the Party-at-large through the Alberta Conservative Newsletter, which is being received by a mailing list in excess of 8 thousand interested Albertans. We conducted an election campaign last spring which, though limited by finances, was positive, responsible – and featured the finest slate of provincial candidates this province has ever seen. I was proud to be associated with each and every one of them. They did a great job — and the slate will be even stronger next time. Our weakness was obvious — We were too late getting many of our candidates into the field — and we failed to field candidates in all constituencies. (I had many voters tell me since the election how disappointed they were that we did not run a Conservative candidate in their area.) (Our Platform was the only one which bore the independent views of most of our candidates. It was not issued as a directive from Party Headquarters). We have, therefore, created an initial public awareness of our Party. There are many in this room in attendance for the first time — There are many more watching these proceedings – observing progress with considerable interest. They want to join — they want to be part – but they are watching — looking for something first. What is it? They want to be assured that this is truly a “people’s party”. They want to feel they are welcome — That their views will be listened to — that there is a place for people of all ages — A place for people from every part of Alberta — from every walk of life — A place for people with a common philosophy. But prepared to accept different views as to how to apply such a philosophy — A party where there is leadership – executive responsibility – organizational procedure — But a party which is democratic — and welcomes new members – new ideas – has open meetings – open nominations – an absence of mystery or intrigue. That’s the kind of party my colleagues and I want — It’s the kind of a party the people of Alberta want us to be — I hope — better than that — I’m confident — it’s the kind of party you want. The next stage in our move forward is to accept and to concentrate our energies on curing our major defect as a provincial party. Our weakness, frankly, is provincial constituency organization. There are many good ones — But not nearly enough. Our target — eighteen months from now – actually a short time – viable and effective provincial constituency organization — already by then searching for — lining up — top flight nominees for Progressive Conservative nominations — Preparing to elect future Conservative MLA’s. That’s our target — My responsibility – but also yours – Let’s meet the target. Tomorrow mornings session is critical — One of the most important at this Annual Meeting. It’s on Constituency Organization. It’s your opportunity to express your ideas on organization — we look forward to hearing them. But over and above the responsibility for the Party as such, we have the public responsibility of the Official Opposition in the Alberta Legislature. We must not forget – that with candidates in only 2/3 of the ridings — we secured 27% of the vote — and the present party has the support of only 44% — Less than a majority of the people of Alberta. Yet they have 55 members compared to our six. This is our public responsibility — it requires that the Party interest be constantly weighed in relation to the public interest. Our duty as the Official Opposition is to first inquire – to thoroughly scrutinize – to bring into public focus – what’s really going on in Alberta — What’s happened in those public buildings over there — what it all means in terms of each individual Albertan – perhaps, for the first time in 32 years. Then to oppose, when we feel that a program or an estimate is not in the larger public interest — Not to oppose merely for the sake of opposing — and to approve when we think that a measure or an estimate is sound. Then, in time, for ourselves to propose how we believe we can be doing better in Alberta — and at the same time, as MLA’s to always remember that we represent a particular constituency – a specific part of the province. This is our task — a challenging one — we know we have a lot to learn — that we are opposing an entrenched bureaucracy of 32 years — But we have a fine team — I’d like you to meet your Conservative Team. This is the nucleus of a new approach – A new team. Alberta – at this time and at this stage of its history – is at the crossroads — A most important time for the people and for the Legislature. We face a financial situation which can fairly be termed a crisis. We are in debt in Alberta — Our unencumbered reserves have been wiped out in a very short period of time — yet our existing public spending programs exceed our anticipated revenue sources — aside, altogether, from expected new demands for the tax dollar — A financial crisis that must be resolved — and resolved in a provincial economy that now rates only fourth in Canada. So we are at the Crossroads. We have three choices. We can continue the complacent drift of the past 5 to 8 years — coasting on our petroleum industry. Or, we can move to an even more big government – big business orientated province – a highly controlled and centralized province – managed by an alleged “all wise” Board of Directors — The sort of managed environment implied by a recent White Paper. Or, we can move to a de-centralized individualistic – admittedly, not always efficient – open society, where the emphasis is on growth — individual opportunity — and quality of life. We choose the latter – but it will be a hard battle to assure such a direction for Alberta. WHY? Because the present administration will either continue to drift as they are, or follow their computer toward deciding what’s good for us every day of the week and perhaps even twice on certain days! Make no mistake about it – The financial position of Alberta has altered dramatically and adversely in the last two years — It might not be admitted – But what are some of the facts? We had a deficit of 82 million dollars last year – we have an estimated deficit of 80 million dollars this year — Almost 160 million dollars in two years. Our debt – the direct and guaranteed liabilities of the province – substantially exceed our liquid reserves — On a per capita basis, the province’s liabilities have doubled in six years. At the same time, our rate of provincial government expenditure has also doubled — doubled in six years! We spend double per capita compared to Ontario – far larger than any other province. We have done this, yet we face – as a province at the provincial and municipal level combined — a future education bill which could almost triple in the next 8 years – to one billion dollars per year on educational costs alone by 1975. We also face an immediate and completely unknown bill to pay for the Alberta Health Plan — All at a time when many of our municipalities are in a difficult financial position and when property tax levels have reached new highs. This has happened in a province which has been fortunate enough to receive into its provincial government coffers in excess of 2 billion dollars from the petroleum industry — something other provinces would dearly love to have – something other provinces with the same demands for services have not had. And yet Alberta remains as only the fourth province on a per capita income basis — There is certainly a myth of performance in Alberta – a myth that must be exposed. It seems that we have three routes to go in Alberta. Three alternative roads to travel in the future. We can continue our complacent drift – relying on our capital revenues from the petroleum industry to provide for our day to day public service needs. In short, we can sell the house and use the proceeds to buy groceries. We can continue to create a false sense of security that everything is great in good old Alberta – that anybody who says it isn’t so is playing politics. We can continue to drift without targets – without priorities – without a long term plan – and giving rosy reports to the so-called shareholders from time to time — reacting to only the most strident voices of the moment. OR, we can go down a new and different route. Its signs are the signs of the computer. It looks modern on the surface – up to date – even exciting. It uses fancy terms like Human Resources. It’s intriguing – but what does it mean? What is the destination? Upon careful study, it seems to us that the destination is clear — It means Big Government – a big business orientated province – limited chance to control our own individual economic destinies. The be all and end all down this route is administrative efficiency. And democracy? Well, only if it is efficient. The key to the route is that somebody else knows better than you what’s good for you. It creates a super bureaucracy conducted by big brother. In short, it’s Paternalism at its worst. I’m not interested in the colour of the paper — I’m interested in how the program affects the citizen of Alberta – Does it help him? Serve him? Or merely cost him more? We do agree that every effort must be made to give full opportunity for the people of this province to develop their capacities. But people are not a resource – something to be used. We in public life are the servants of the people – elected to serve you – your representatives — We are not always right — We certainly are not infallible. OR, finally, we can return to a tried and tested route – one that we know – one that works — one that has new turns – new conditions – arising out of todays circumstances. Hence, it requires contemporary ideas – a modern point of view. It’s a route where complacency is dangerous – energy essential – a fresh new approach always required — It is an open society. It is the route where the emphasis is on opportunity – on enterprise – on accelerated growth – on research – on investment in tomorrow – Where efficiency is important, but democracy more important – where government believes that, if given the facts, the people will support logic – that there is no need to mislead – that there are matters more important than government – that the quality of life must be balanced with affluence. So we are at the crossroads. We have three distinct routes to go. We would like to see the people of Alberta go down this latter route toward an open society. It’s the Conservative way — We think it’s the right way — It’s where the individual is paramount. But it’s not an easy road. It has a road map that is sometimes hard to read – At times hard to explain. It’s not always easy to know when you are still on the road. For this reason, it is essential that a Party who wants to proceed down such a road has Guideposts to point the way. At the last Annual Meeting of the Party, we put before you Twelve Guideposts for the Alberta Conservative Party. It should be emphasized that we are the only Party in Alberta to have done this to date. We are, in short, the only Party with a declared set of meaningful principles and values established for our position in provincial politics. We used these Guideposts in the last election. We used them to test the consistency of our Platform to assure if reflected the Conservative principles. We used them to explain to our candidates what we stand for. This afternoon you will be asked to confirm them – or amend them. For we must always know what we stand for – what our purpose is. It is not merely victory at the polls. With such a set of Guideposts, the Conservative position can be evaluated on the major issues facing Alberta today — On priorities in public spending — on the distinction between an essential service and a desirable one — on the expansion of our economic pie, rather than the mere redistribution of it — on our reliance on the voluntary efforts of our citizens, compared with those of our bureaucracy — on the individual’s right to exercise his judgement without being regimented in the guise of public benefit — on whether or not we are prepared to accept the concept in our society that rights are the rewards of responsibility. And perhaps in confirming these guideposts, we will see that the issues facing Alberta are complex and difficult — That the honeymoon is over in Alberta — that there are no easy answers. But nevertheless, that the issues must be faced — The public must be informed. The public good sense and judgement must be relied upon. And with such guideposts, Alberta can have a fresh new approach to its public affairs. An approach which challenges the public-at-large – moves our society forward toward common objectives. The highest quality educational system. The elimination of shortages in Health and other public services. The reduction in the numbers of dependents on Welfare. The improvement in our income levels to that comparable with any other province. Accomplished with the framework of a provincial and municipal financial structure of stability. Such objectives to be realized within a Canadian Confederation – whose unity develops with the active participation and with the political leadership of the people of this great province of Alberta.